A hundred years ago, Casablanca was little more than a small coastal town, struggling to come to grips with its deepwater Atlantic harbour. 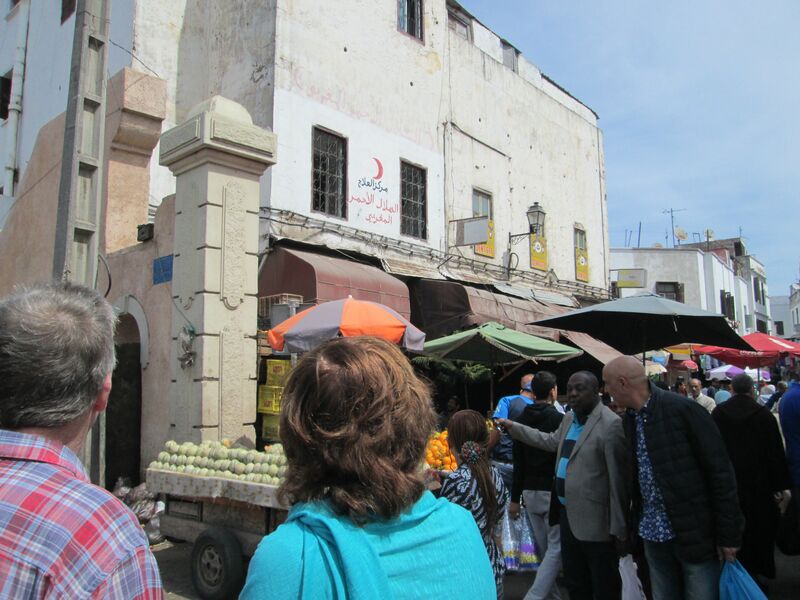 The walled area delineating the Medina is still there, while greater Casablanca has grown into a vast city of three million people. The French colonial system established the modern city in the inter-war years. Wide boulevards are lined with white-stone buildings with ornate iron balconies. Fine civic buildings of the nineteen thirties preside over public green spaces beneath towering palm trees. The effect was to lend the centre an elegant air, while re-echoing the original designation ‘white house’. Sadly overcome by time, dereliction and a societal aversion to commerce and its attendant boon of social celebration, Casablanca today can seem more grey than white. Individual and collective poverty have eroded the civic fabric, dirt and dilapidation have taken root. Men perch like gloomy crows at pavement cafes, a glum parody of gaiety Parisienne. Unattended by female company, they sip thick coffee and watch the world, or this part of it, shuffle by. Not often in a city do I wonder what it is I should be doing. Alienation has its compensations. Chaotic shoots of commerce, the creative individualism of traffic, warp the elegant street plan, push against the homogenous conformity. There’s life in the street-hawking, the hustling for work and pay, as back street operations infiltrate Main Street. Occasionally the plan prevails in a positive sense, as surprising green spaces open up an oasis of calm, an opportunity of rest. The ancient city still prevails, a medieval way of life endures. If the Medina is not widely renowned for its charm, it does at least display plenty of spirit. At the gateway we are knocked off course by some aggressive hustling. We turn, by way of evasion, into a localised web of backstreets that becomes a bewildering maze. The river of humanity surges around us. This is where locals buy and sell; fruit, meat, vegetables and all the goods of life. Repair shops, two seater cafes, bric-a-brac stalls jostle for business. Live chickens are exchanged, weighed, haggled over and strangled in hectic bouts of shouts, gestures and desperate clucking. Mopeds, impossibly weighted with food and booty, weave through pedestrians with casual abandon. Our companions have taken off like scalded cats and it is a struggle to maintain contact. I wonder if this is the proper place to be festooned with a Canon. Not through any fear of theft, or even the wrong kind of attention – the locals are indifferent to our presence, although some children are greatly amused. No, this is a place to be experienced, not itemised. Anyway, it is rude to point. 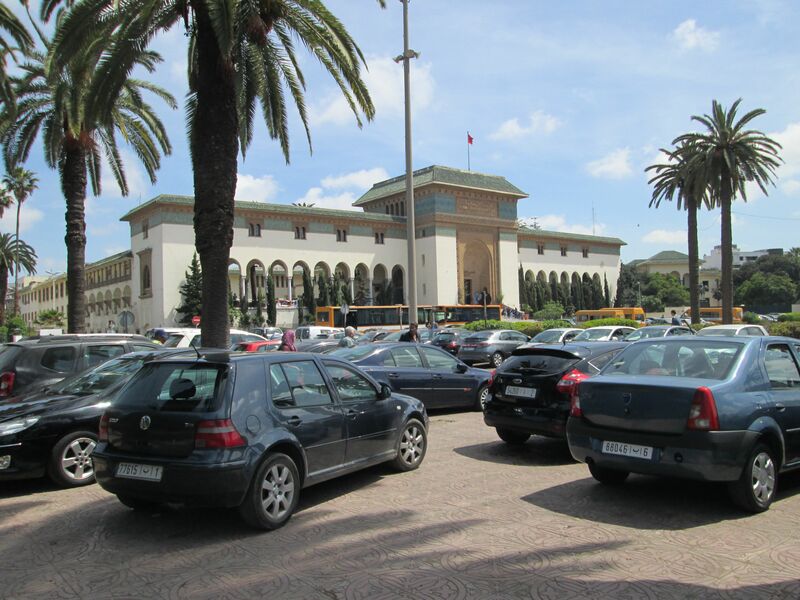 Our journey takes us to the Hassan II Mosque. 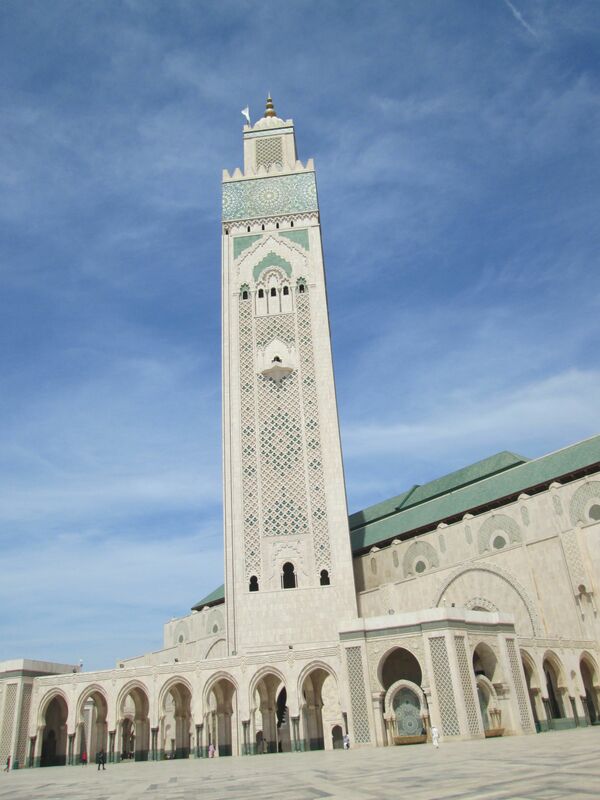 This towers above the city, its two hundred metre minaret being the tallest in the world. The massive complex is isolated on a plinth of blazing blue sea and sky. 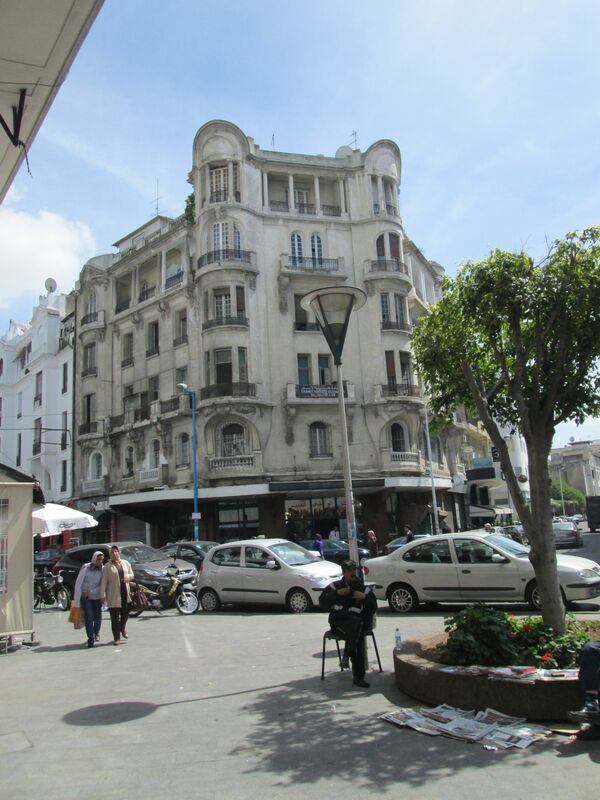 The king was keen to give Casablanca an iconic sight. This is it. People flock here, drawn like filings towards a giant magnet, drawn to its prospects of prayer and peace. If Morocco is dubious of the benefits of mammon, it can at least feel itself close to God. As we rest by the giant plaza, some local schoolchildren decide to wrestle nearby. A guard, whip poised, is not amused. There are always imperatives for behaviour, even for the very young. The children depart, but still in good humour. Where there’s life there’s hope. Where there’s laughter too. Away from the spiritual island, some seeds of economic advancement have sprouted. Along the coast road, new apartment blocks gleam. Aloof from the crumbling city nearby, they are the future, perhaps. Where we re-enter the Medina, there is a small park, its trees promising shadow where children play, the older folk sitting and talking. This quieter, residential precinct, has a more comfortable ambience. A village of thousands, where life can find its own pace. Rick’s American Bar is to the seaward side. Established some years back in homage to the Curtiz film, where Bogart and Bergman conjured everlasting love and eternal art from monochrome light. There never was a Rick’s Bar, of course, it is all smoke and mirrors, anther Hollywood trick. What better place to explore the universe than inside your head, in the dark beneath splaying beams of magic light? 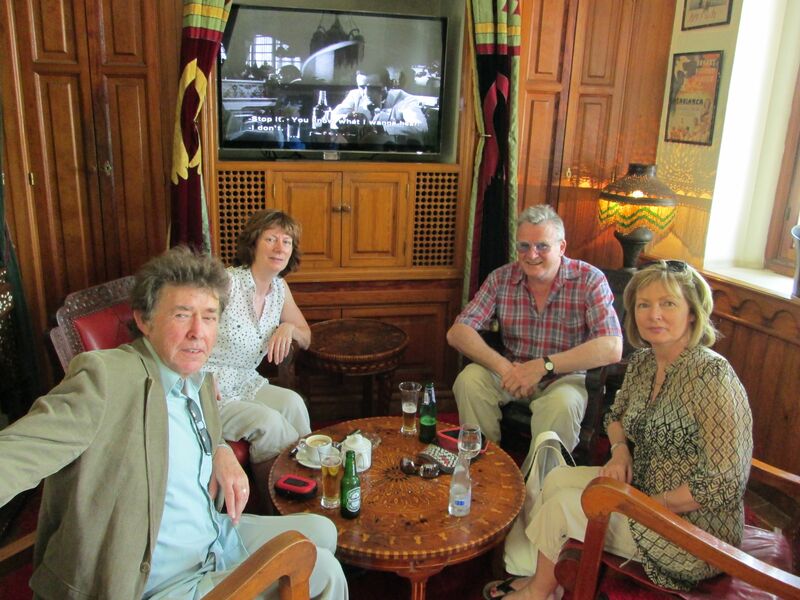 So, Rick’s Bar is made flesh and from the unpromising stone of Casablanca weaves its own form of magic. We enter the sedate and seductive world imagined by the movie. White walls, tiled floor setting off the heavy, ornate furniture. Light ambushes the cool interior. It is much more welcoming, intimate than we had anticipated. No crass Americana here. We order drinks, something which might have been possible elsewhere, just neither obvious nor desirable. This is something you do behind closed doors here.